About: The Sri Ramaswamy Memorial University Graduate Engineering Entrance is commonly referred to as SRMGEET. Conducting body: SRMGEEET is conducted by SRM University, Sonepat, Haryana. This entrance exam is available for students across India. The University has three campuses- two in Tamil Nadu and one in New Delhi/ NCR area. SRM group of institutions was declared as a University in the year 2002 by UGC. Level: SRMGEET is a National level examination. Students across the nation can apply for the exam and get admission in SRM University for M.Tech course in different disciplines. Mode: SRMGEET will be in the Online mode in the month of April every year. Frequency: SRMGEET is conducted once a year in the month of April for admissions in SRM University. Course: SRMGEET is apt for candidates willing to gain admission into the M.Tech course at SRM University. Application Window: SRMGEET 2018 Application form will be available for students from 2nd November 2017 until 12th April 2018. 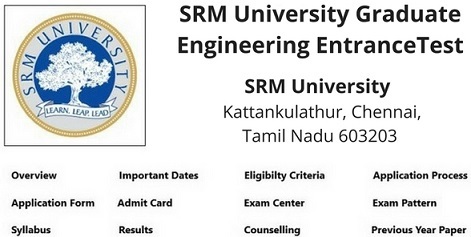 Exam date: SRM University will be conducting SRMGEET in the month of April every year. SRMGEET 2018 will be starting from 23rd April 2018 tentatively. Nationality: For a student to eligible for SRMGEET 2018, he/she should be from India. Minimum Marks: A student must have completed an Engineering degree in respective discipline with a minimum of 60% Marks. Compulsory subject: In SRMGEET 2018, Mathematics is a compulsory subject, which candidates have to write the exam for. Subject Code: Students have to write the exam for subjects based on their discipline. Each subject has its own Code, which has to be noted by students. Sections: In SRMGEET 2018 candidates have to attend only one section. However, there will be 12 sections in the examination. The number of questions: The number of questions in SRMGEET 2018 is 100, which a student has to answer in a duration of 2 and half hour. Application window: All the candidates who wish to appear for SRMGEET 2018 have to fill the Application form from 2nd November 2017. The last date for the Application to be filled is 12th April 2018. Mode: Students have to fill the SRMGEET 2018 Application form through Online mode. Credentials: Candidates are required to enter their Enrollment number and Password to get the SRMGEET 2018 Admit card. Mandatory: It is mandatory for a student to carry the SRMGEET 2018 Admit card to the exam centre. Students without the Admit card will not be allowed to write the examination. Result dates: SRM University will be declaring the results of SRMGEET 2018 after three weeks of the exam, tentatively on 3rd May 2018. Availability: SRMGEET 2018 results will be declared by exam conducting authority on the Official website. Students have to log in to the Official website to check their results. Counselling date: Candidates will be getting the invitation or a call letter for Counselling by the University after the SRMGEET 2018 Results. Counselling is supposed to start from 30th May 2018 tentatively. Merit list: The final merit list of SRMGEET 2018 will be prepared and declared after the Counselling process.